As the WWII drama begins its second season, we visit the Santa Fe set to see how science and history influenced the creative process. An eerily accurate replica of the first atomic bomb sits at the base of a 100-foot wooden tower in the middle of a Santa Fe ranch standing in for the 1945 Trinity test site. A short trek up a hill reveals a dusty collection of tents and makeshift structures comprising more of the expansive set of WGN America’s Manhattan. 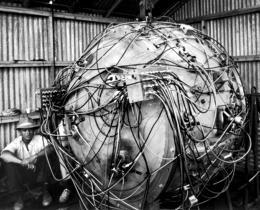 The World War II drama, about the race to build the first atomic bomb, launches its second season on October 13. Cellphone cameras are ordered down. “We don’t want pictures of the bomb leaked too soon!” a publicist tells the group of visiting reporters. It’s like a science-geek version of revealing the bridal dress before the wedding. The warhead—known as the Gadget and used in the first nuclear detonation test, codenamed Trinity—has taken months to replicate from a handful of available nonclassified pictures, but, belying creative license, like the protruding cylinders that are actually spray-painted cat-food cans. Ashley Zukerman, who plays physicist Charlie Isaacs, takes in the Gadget. Such meticulously designed period surroundings and their grounding in scientific and historical research has significantly shaped the production—from writing structure and direction, to acting choices. But the process becomes an ongoing loop between these points, as each fuels the other with new ideas. Director Thomas Schlamme poses with a replica of the Gadget, designed by prop master John Harrington. At the same time, production design can also reiterate a story note. Ammon remembers coming across a photo of a Trinity site camera bunker that visually suggested movement toward modern times, and suggested incorporating its structure into the set. “It was another removal from the world as we know it—from Los Alamos, where everything was single-gable structures, to moving out to Trinity, where there were hard-wall tents made out of wood with fabric canopies, where we’re preparing for the test,” says Ammon. “This was a board form concrete bunker that looks like something Marcel Breuer would have designed. It’s modern and chic in a way, and represents the transition between seasons. From a performance standpoint, such a remote and immersive set enabled the actors to find additional emotional tone and character nuance the way they might by donning a costume. A short drive across the ranch is a rolling landscape dotted with quaint family homes, children’s toys, and laundry lines, serving as Los Alamos, the New Mexico military compound where the scientists and their families lived and worked. It feels like the middle of nowhere. The creative team had to constantly check present-day mannerisms and thinking at the door, and write, direct, or play to specific moments in the realities of each character. The production closely consulted science adviser David Saltzberg and science historian Alex Wellerstein to maintain the integrity of the physics and historical events. On occasion, their adjustments altered creative direction for both accuracy and dramatic flourish.